I have been living in Spain for 6 years. I have been living in Spain since 2012. Why did we use FOR in the first sentence and SINCE in the second sentence? 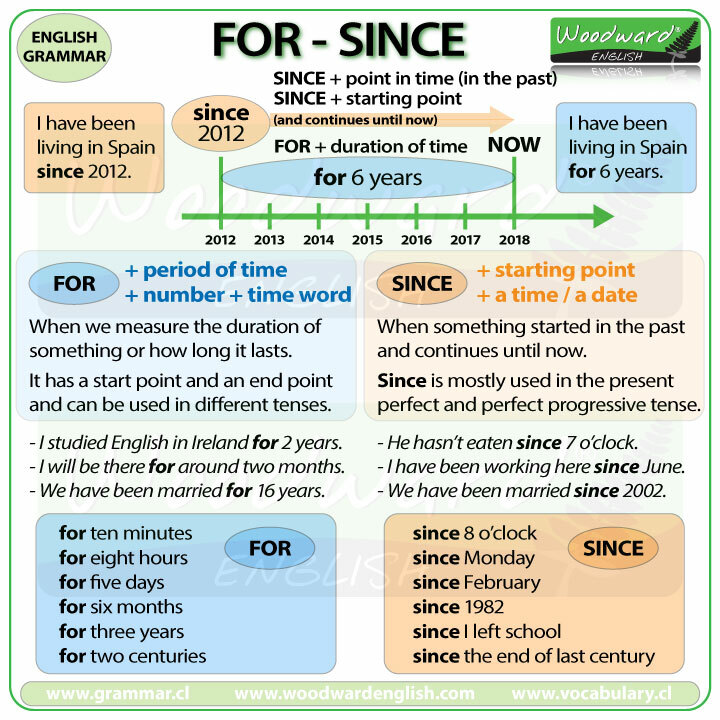 For and Since are prepositions. Let’s look at the difference between these two words. Now we are in 2018. I first arrived in Spain in 2012. 2012 is the starting point. We use SINCE with the starting point of when something happens and that continues until now. Since gives the starting point of actions or events and refers to when things began. Now, what is the period of time between 2012 and 2018? It is a period of 6 years. 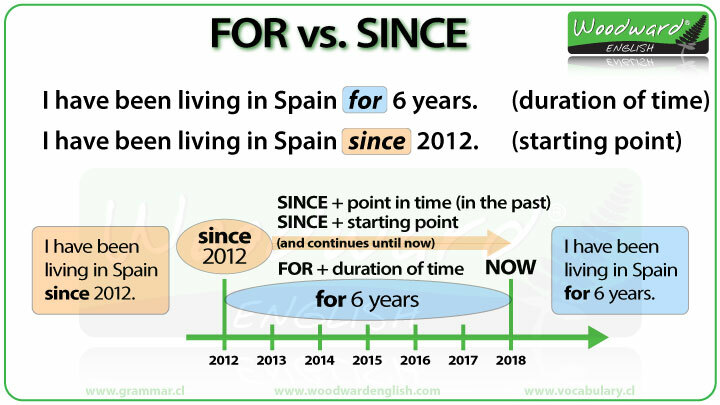 The duration of time I have been in Spain is 6 years. So I can say…. I have been living in Spain FOR six years. We use FOR with a duration of time. This is often a number plus a time word. FOR is used when we measure the DURATION of something or how long it lasts. It has a start point and an end point and can be used in different tenses. I studied English in Ireland for two years. I will be there for around two months. We have been married for 16 years. SINCE is used with a starting point or a time or date. It refers to something that started in the past and continues until now. SINCE is mostly used with the present perfect and perfect progressive tense. He hasn’t eaten since 7 o’clock. I have been working here since June. Notice how everything after FOR refers to a duration of time. We could also say For a long time (which is less specific) or more informally, for ages. For a while which normally means for a short period of time, not a long period. Notice how everything after SINCE refers to a starting point.